Many students are terrified of plagiarism and rightfully so. If you are accused of plagiarism, there is a good chance of you being expelled or being placed on academic probation. You do not want this to happen because your academic career will be ruined. You will not be considered a plagiarist if you adhere to these guidelines. 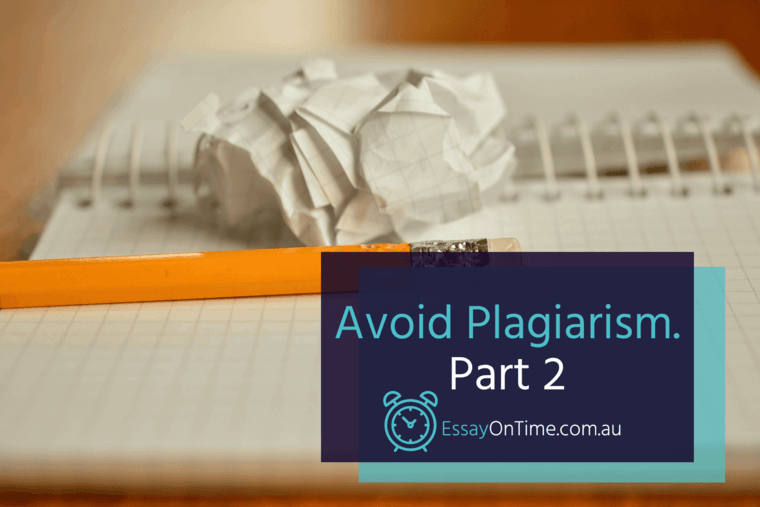 If you missed the first part How to Avoid Plagiarism. Part 1. Citation System click here! If your idea is best illustrated by the words of another author, you can borrow them so long as you cite his work. This method is widely used in literature, linguistics and similar studies. Do not forget to clearly identify the author and his work as well as why you are using his words. Consult with the relevant citation system manual to arrange the citation accordingly. 2. Master the art of paraphrasing. It is not considered plagiarism if you paraphrase the original words and reference the source. Think of how you can say the original author’s idea in your own words. Sentence structure: if the author writes in long complex sentences, try to simplify your text by using short and simple sentences. It’s easier to read and understand. Vocabulary: authors usually tend to use specific words in their writing. Look for the best synonyms that would change the wording but not the original meaning. The tone of voice: do not try to copy the original style but rather tell it your way. 3. Include the ideas from the source by summarizing it. You can summarize the information read from an original source and include it into your paper. Define the main ideas and present your explanation. Be sure to mention the author, the title of work and year of publication. 4. Familiarize yourself with copyright basics. When plagiarism happens outside of academia, it can be considered a crime if you infringe upon someone else’s copyright. As a general rule, facts cannot be protected by copyright. It means that you can use any facts in your papers to prove something. However, be careful with the words you use to express the facts. Copyright protects unique or original statements from copying. 5. Understand when the citation is not needed. You should not include citations with every single word you use. Otherwise your research will be too hard to understand. You do not have to make references to common knowledge, folklore, local legends, or widely known historical facts. There is no need to cite your own experience, songs, or multimedia. If you are unsure of how to avoid plagiarism in your essays, check with your professor, and ask for his advice, or check it with uor free plagiarism checker here. Your professors will be more than willing to help you if you are afraid that your work might not be unique. If you think your professor is unapproachable, however, you can always consult with the writers of EssayOnTime. They have years of experience writing papers, and they can ensure that any paper you write is 100 percent unique. Contact us EssayOnTime today to get help fast!